Welcome to Pound Wood Nature Reserve. We hope you enjoy your visit. Pound Wood is one of a string of woods in Daws Heath that together form a wildlife corridor in an essentially urban area. By active management of the wood we encourage a wider range of flowering plants like common cow wheat and wood spurge to flourish alongside bluebells and yellow archangel. The map below shows the stopping points along the trail described in the trail guide. These are labelled 1 to 14. Click on each of these in turn to follow the tail as described in our leaflet. Editor’s Note: The main text here is taken from the old Trust Trail Guide leaflet on Pound Wood and appears in the standard font. Additional comments from the editor are in this modified font. Similarly, supplementary images are also captioned in this modified font. The Trust has recently published a new Trail Guide. This page will be re-written in the near future to reflect this new guide. Note that this page has not been optimised for printing out, as it tends to split images over pages! When the new Trail Guide is included, then there will be a suitable printer-friendly styles included. 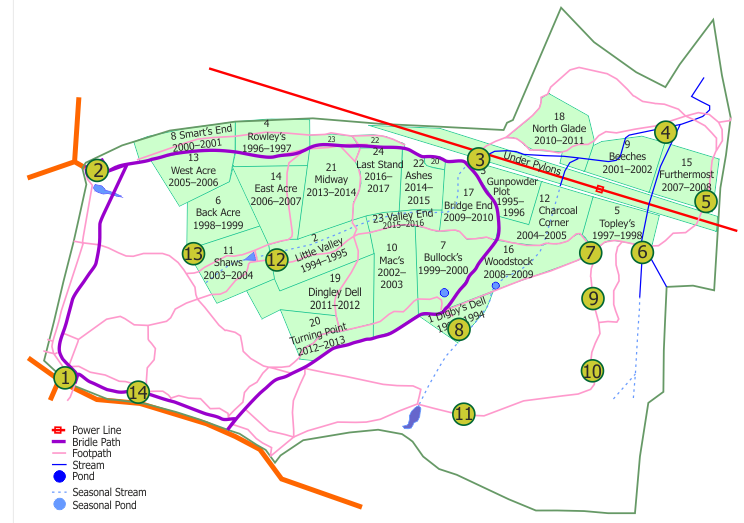 As you click on each of the numbered trail points, some explanatory text will open below the map. 1. Welcome to Pound Wood. As you enter from Bramble Road or Church Field, walk north keeping the field on your left. This is the youngest part of the wood, which was probably established on abandoned meadows over 150 years ago. As you near the northern entrance you meet a bank and ditch coming in from your right. This was the original boundary of the ancient wood. Most of Pound Wood is ancient woodland, and has been here since at least medieval times. Today’s trees are much younger of course; new generations of trees germinating and growing as the old ones die. However, there is much evidence that this process has been carefully managed over the centuries by Coppicing, a renewable source of timber in order to supply Pound Wood’s owners with a sustainable source of wood and thereby a regular income. The image above shows Carter’s Ride, to the east of Tile Wood Corner in the Spring of 2015. 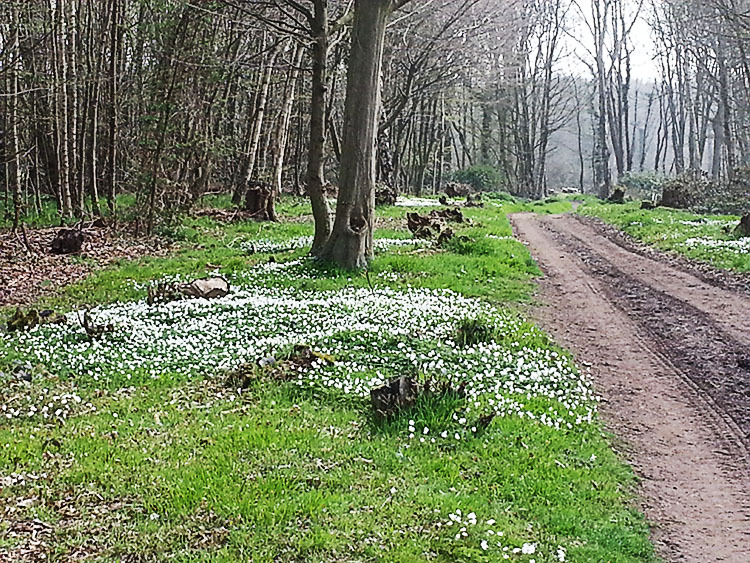 There is a good sward of Wood Anemones to the left (north) of the path. Keep between the northern edge and the horseride for some 400m. In April and May you will enjoy a good show of bluebells. Some trees - mostly oak - have been allowed to become fully grown ‘standards’ which when eventually felled would have provided timber for construction, shipbuilding and furniture. The last clearance of standards (then probably already 150 years old) was in 1750. Other trees, mostly hombeam and sweet chestnut, were cut at the base of the trunk (‘coppiced’) every 8 to 15 years to provide poles, firewood and charcoal for gunpowder. The earliest written record for this in Pound Wood is 1613. The result is many smaller trees re-growing quickly from the same ‘stool’. This system was only abandoned when the demand for such wood declined in the 20th century, with the most recent cut in this area in 1947-51. Coppice management recommenced when the Trust purchased the wood in 1993, for the system encourages a rich diversity of wildlife by allowing light to penetrate to the woodland floor, so ground plants start growing again. Our plan is to coppice approximately half of the wood over a period of about 15 years, leaving the remainder. 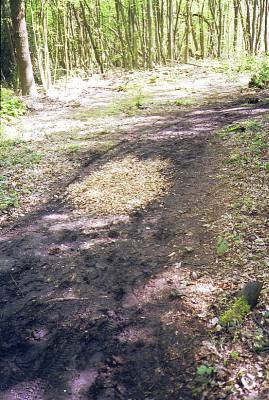 The photograph to the left shows the chippings laid on Carter’s Ride to the east of Tile Wood Corner. These chippings helped prevent the path degenerating into a mudbath! Subsequently, the path has been surfaced as a proper bridleway, although this has deteriorated in recent years. 3. Beneath the power line. Turn left under the cables through the squeeze gate near the site of the 1995/6 coppice called Gunpowder Plot. Eastern Electricity regularly coppices under the wires for safety reasons and this has resulted in a greater variety of plants and shrubs and, except after it has just been cut, more food and cover for wildlife. Look out for hazel, guilder rose and broom. The nationally rare wild service tree is quite abundant at the start of the path heading east through open woodland typical of much-overgrown coppice. Here you are most likely to see grey squirrels, jays and the green woodpecker and, in summer, the yellow flowers of the common cow wheat. 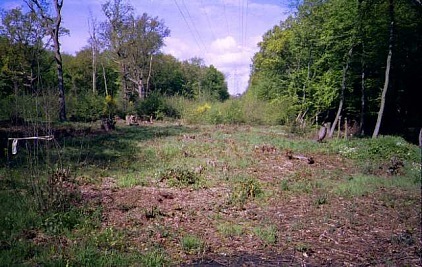 The photograph shows the cleared area below the power lines. During the summer, this develops a rich ground flora including abundant Cow-Wheat. It is also a favoured site for Wood Ant nests. All of our three streams end up here to flow north under the Arterial Road, then into the River Roach. This area can become quite wet when water from the covered reservoir at the end of Bramble Road is discharged into Miles Brook. Look out for self-seeded Rowan saplings. Cross over the bridge, bear left and then turn right keeping the edge of the wood on your left. Before going back under the power line and about 40m to your right, find the large tree with the smooth grey bark. It is the most substantial beech tree here and has woodpecker holes now used by starlings. Compare it with the hornbeam trees which are so common in the wood, for they are often mistaken for beech. After passing under the lines, follow the path which bears right. There is no way out on the southern boundary from this point. 6. Codgers Crossing and Keiths Glade. The over-large bridge here has been created to avoid a damp area and slippery slope. It is 34ft long and won an Essex Amenity Award in 1995. The name was chosen by the (mostly retired) volunteers who built it. Each autumn the vegetation is cut back to continually provide an open habitat for the benefit of butterflies and other insects. In normal years the glade favours plants requiring boggy conditions. Figwort, Wood Spurge and Great Woodrush are found here with a number of different grasses. It is the only local site of the rare Bristle Scirpus and is a good place to listen for bird-song. Head west along the wide path to stop 7. The storm-damaged branches were cut to make them safe and are to be found nearby in a ‘habitat pile’. Dead and decaying wood is an essential part of the woodland ecosystem. Apart from providing a multi-storey apartment block for small mammals, the myriads of life-forms in these heaps help to return the nutrients to the soil, and are the food for other creatures. In a damp autumn, note how many different fungi appear on the dead wood as well as on the ground. So you see, it is important that a nature reserve does not become too tidy. Go straight on to Digby’s Dell (Stop 8). 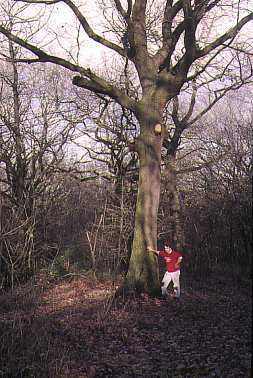 This photograph of the damaged oak was taken in winter, where you can clearly see the surgery that has been done to it. 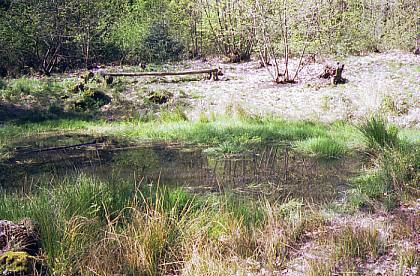 This area contains a small pond which, since re-excavation in 1993, has been the only permanent water in the wood. Some locals think it was a bomb crater. This was the first area to be coppiced in 1993/4, and each year since the area around the pond is cleared of aspen suckers and bramble. The pond attracts dragonflies. Look out for the broad-bodied chaser. Colour is provided by flowers of marsh bedstraw, water violet, lesser spearwort and foxgloves. Return to point 7 and turn right. This photograph looks south across the pond to the rustic bench on the far side. It also shows the vigorous growth of the Chestnut stools beyond. You are walking along the ancient path which separates the parishes of Hadleigh and Thundersley. The shallow pits here are probably old gravel workings which, in centuries past, supplied building materials to Daws Heath. The large oaks here are favoured by treecreeper and nuthatch. The old boundary path is blocked by wind-blown trees mainly from the 1987 storm. We have decided to leave this area of dense undergrowth free from human interference to allow sensitive species such as the dormouse undisturbed. 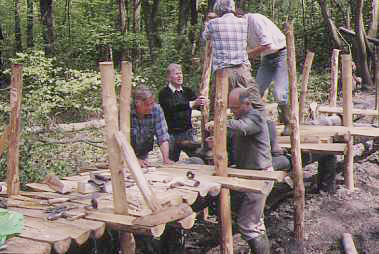 The Trust’s volunteers have created a barrier using the ancient technique of hedge-laying. Suitable young trees are cut part way through, bent over and woven into a hedge. The sap can still rise through the uncut part and so the tree continues to grow, forming a dense barrier. The alternative bypass route leads to stop 11. 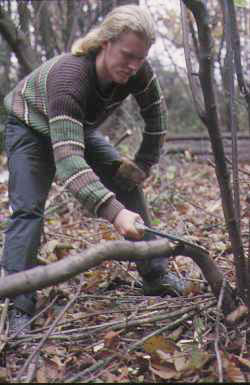 In the picture, a volunteer is cutting through a hornbeam stem that has been bent horizontally. Above: Bluebell Path in spring in the late nineties. If you are not here in late April or early May you must note in your diary to return, for the sight and smell of a blanket of bluebells should not be missed. 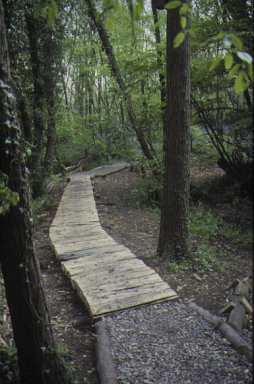 The extensive boardwalk over a ‘seep’ or spring at the start of Hall Brook is again the work of keen volunteers. Now make your way to point 12 by turning right at the baffle near the large ivy covered oak tree and crossing the bridleway. 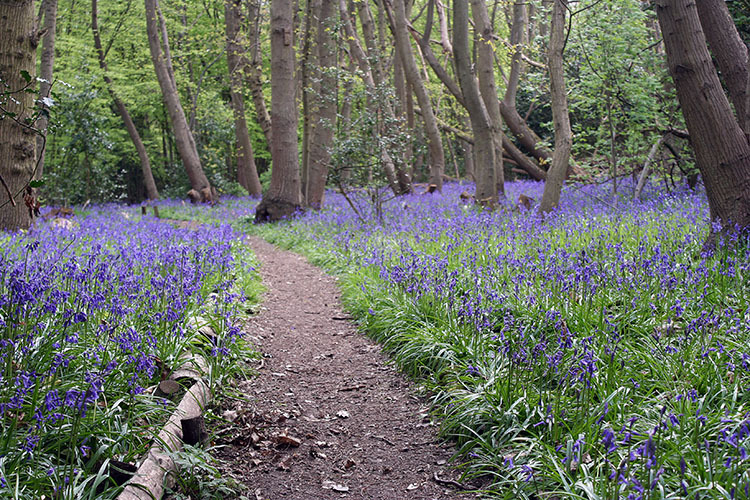 The images above are of Bluebell Path, mostly in the Spring. 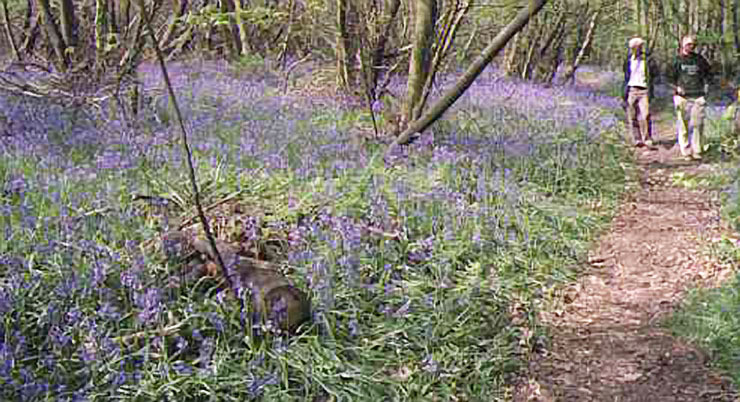 On either side of the path, there is typicallly a sward of Bluebells extending into the wood. Parts of the path became flooded early in 2015 or partly blocked by debris. However, by August, these had dried out revealing a dry path. 12. Little Valley and Shaws Dam. Little Valley was our second coppice site in 1994/5. Regeneration on the northern/lower side is exceptional with huge numbers of seedling trees. On your left is a very big habitat pile formed around two windblown oaks which is really dense with bramble and alive with large ants. Wood ants were introduced in the last century and are very common locally. Up to a million live in each nest and we must have upwards of 50 nests. They eat huge numbers of insects climbing to the very tops of the trees for them. When disturbed they spray formic acid in defence and may even bite. 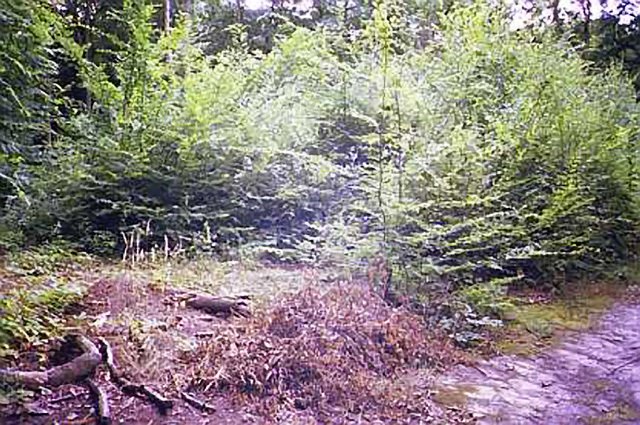 The picture shows extensive regeneration of hornbeam. There is a wood ants’ nest to the lower right. Little Valley has shown an exceptional growth of hornbeam since coppicing. Some of this is the re-growth from the coppice stools. However there has also been a massive germination of hornbeam seeds in the spring following coppicing. This is possibly because there was a wet spring following an eighteen-month dormancy period, ideal conditions for hornbeam germination. A consequence of this is that we are having to clear much of this thicket. The large hornbeam stool found on Shaws Dam is a clue to the age of this man-made structure. Archaeological research is inconclusive, but we surmise this created a medieval pond, possibly a watering place for animals, or used for some industrial activity, maybe making mud for charcoal kilns. Walk upstream and you will pass another area of windblown trees reserved for wildlife. We pass over the other end of the woodbank referred to in note 1. These banks are valuable archeological sites in themselves. they were originally much higher with the bank on the inside of the wood and the ditch on the outside. The bank would have a stock-proof fence or pale on the top. Turn right along the horseride inside the wood to return to the start. This southern boundary was coppiced in 1995 to encourage the regrowth of a traditional hedge and to avoid overghanging trees interfering with traffic. We hope that this trail has helped you to understand the history, natural history and management policy of the nature reserve. The purchase of Pound Wood was supported by The Countryside Commission and over 700 small donations, mostly from our members. Will you please help us to protect this and other areas by becoming a member of the Essex Wildlife Trust?